Delicious is our tasty theme for March with elegant look and versatile design. Delicious is not just a great choice for caterers or restaurant and food shop owners, but for anybody seeking a fresh and clean looking theme. 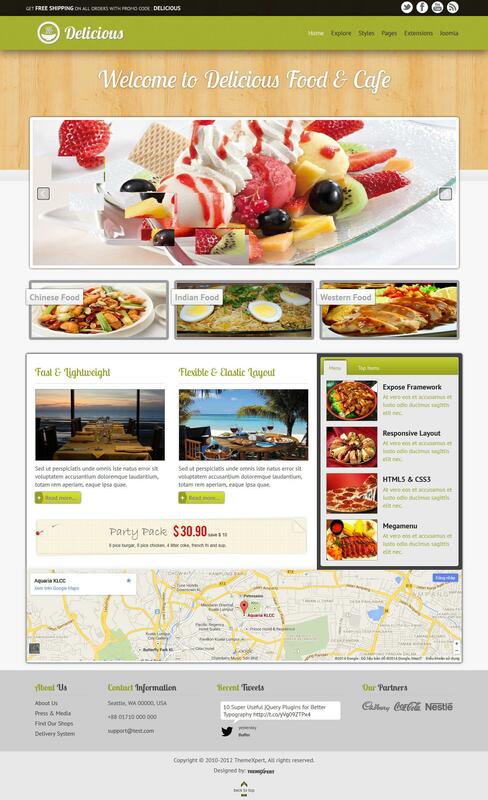 Our Club templates packed with all new features and enhancements, Delicious is not exception from that. Responsive design built with all latest technology such as HTML5, CSS3, Modernizr and cooked with jQuery. Delicious support Virtuemart e-commerce extension along with K2 for blogging. Thanks for our Expose Framework which allow us to build such flexible theme.